This locomotive is still for sale and the bidding starts on March 3rd. 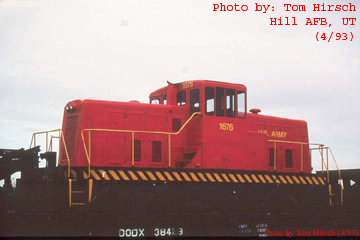 If the Oklahoma Railway Museum waited until January 26, 2014 to inquire about obtaining this locomotive through the Federal Surplus Program, then it was to late. There is a timeframe that is established for this property to be available to other government agencies and others. Once this equipment is put up for bid to the general public, which it is now, it is too late. The U S Government does not handle these sales. They use a private contractor and once they have it, they determine how it is sold. They mostly use the online bidding, but sometimes they go a completely sealed bid process and you or i will then never know what it sold for or to who. Next bid is $45, as of 3/3/2014 05:13 Eastern Time. Get out the popcorn -- do people snipe these auctions? Anyone who's serious is going to bide their time, wait until 30 seconds before the auction ends and bid a few dollars more than the current high bid. The other bidders will never see it coming and won't have time to counter. I won an auction on eBay exactly that way. While there's a big difference between a locomotive and a home appliance, the basic principle is sound. My preferred way of getting stuff on ebay as well. However GovLiquidation does not work that way. I found out the hard way if you bid in the last few seconds it adds another 15 minutes to the auction time. That's the way it should work. Ebay has become infamous for auctions being "sniped" at the last second. The last millisecond actually, as there are scripts out there specifically designed to bid at the last possible instant. eBay has somewhat reduced the problem by providing a feature where you tell it the maximum you're willing to bid, and it will then match bids up to your maximum. You certainly never see a real auctioneer stop bidding at a certain time if bids are still rising. By adding 15 minutes if a bid is placed less than 15 minutes before closing, it allows all bidders a fair chance. It increases the profit for the seller as well, by making sure everyone has time to bid the maximum they're willing to bid. It seems like a reasonable and fair solution to me, after all, the concept of an auction is "Who's willing to pay the most for this item? ", not some wacky videogame of "Who can click a mouse at the last possible instant?" I found out the hard way if you bid in the last few seconds it adds another 15 minutes to the auction time. The GE went for $14,833.33. What was the final bid on the Alco? In addition to the four ex-VRE cars listed earlier in this thread (402, 404, 405, and 407), four more are now being offered for sale: 401, 403, 408, and 409. Perhaps this locomotive's trucks will need to be removed if it travels under overhead wires to its new owner. We'll soon find out. What did the Baldwin go for? Who got it? I visited Fort Lee last Friday (3/28) and met Robert Franzen of Steam Services of America, Sylva, NC, who was the successful bidder on two of the eight ex-VRE cars stored in the warehouse area on the north side of Fort Lee. Robert said the other six were purchased by a scrap company called River City. 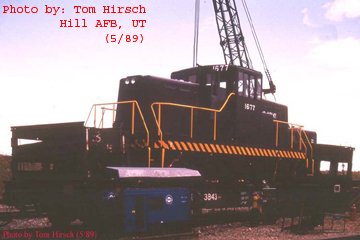 He was planning to ship his two cars to Minnesota for use in excursion operations and was preparing them for movement. Originally there were ten ex-VRE cars but I don't know where the other two went, or when. Robert also said he successfully outbid three scrappers to buy ex-US Army 612, the steam locomotive stored for decades at Cass. He's interested in Army financial assistance in restoring it and possibly operating it on Army base railways around the country in excursion service, perhaps as a recruiting tool, but unfortunately I had to give him many reasons why that is extremely unlikely to happen. Raising the necessary funds and finding a place where the locomotive can be restored is going to be a serious challenge. The German railway cannon formerly displayed at Aberdeen Proving Ground, MD, is on a short spur track on the east end of the warehouse area and it's protected by a temporary metal shelter, probably to contain lead-based paint chips as it's restored. Robert called my attention to another railway gun on the opposite (north) side of Route 36, right next to the NS spur that enters the warehouse area. I drove over to see it and a sign next to it identified it as a US Army railway gun later turned over to the Navy. It has been freshly painted with olive drab paint. In May 2001 I saw a very similar gun at Naval Surface Warfare Center Dahlgren, VA, and it's possible it's the same one, as there has been talk over the years about moving it. During that same visit to Dahlgren I also saw a carriage without a cannon, so it's possible a cannon was remounted onto the carriage and the railway gun at Fort Lee is that one. I've sent emails to the public affairs office at Dahlgren and the Ordnance museum at Fort Lee for information on the gun's background, but alas, I've received no response from either. If anyone in this forum has information on it, please share. I believe the only other railway gun in the entire country is on display at the Washington Navy Yard on the south side of DC next to the Anacostia River. If anyone knows of any others, please speak up. There have only been 4 of the ex-VRE rail cars sold. There are 4 more that the bidding opens for on April 7, 2014. Thanks for the correction. When Robert told me he'd bought two of them, I asked who bought the others and he said it was the scrap company. He was probably referring to just the other two and I mistook that he meant the remaining four as well. Very possibly the scrapper will get them as well.